Club Conflict is home to all sorts of folks including PC and console gamers, music lovers and more. We are supported by some of the industries' leading names in digital entertainment, services and hardware. Club Conflict leans upon these organizations to provide our members with the highest quality related products, services and entertainment. Please click the banner ads below to visit our friends! Silverstone Technology is our Grand Prize Sponsor! Since 2005, Silverstone has been supporting Club Conflict members by sponsoring our annual LAN Party event! We love the world-class quality of Silverstone. Their products are world renowned. (7) Lucky members of our Counter-Strike Source Season 15 Championship Team won black Silverstone Precision PS07 micro-ATX case! Thanks Silverstone! SteelSeries is known throughout the competitive gaming world as a world class manufacturer of quality gaming periphereals. Many of the best competitive gamers around the world trust SteelSeries products to help them get the "W". Season 15 Counter-Strike Source Second Place team members received SteelSeries Gaming Mousepads. Click the image banner above to visit SteelSeries. Check out all of their great products. Scope out your next upgrade to help you gain a competitive edge on your opponent. Thanks SteelSeries! Discount ASP.NET has supported Club Conflict for years with complete, top-of-the-line Web hosting. If you need quality, stable and reliable Web hosting, look no place other than DiscountASP.NET! Their control panel is full featured and their services are outstanding! We are pleased to be supported with such a reliable hosting partner that really knows the ASP environment. Thanks DiscountASP.Net! Chicago heavy metal band, Habit of Force, is the Official Sound of Club Conflict Online Gaming League. Their incredible sound and energy eminates throughout Club Conflict. Their intensity, greatly compliments that of our Counter-Strike Source matches'. Their album Habit of Force (2011) is now available! You can purchase it in our shop. Look for other Habit of Force merchandise there as well. This band not only rocks the heavy metal stage, they also rock at Counter-Strike Source! Habit of Force has been known to show up at Club Conflict sponsored LAN Events. They performed live at LAN in the Highlands 2010 and 2012! Thanks Habit of Force! Game Servers is the sponsor of our league's match servers. Game Servers is one of the largest and most trusted game server providers in the world. 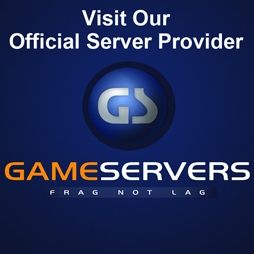 We are happy to have Game Servers as our Official Server Provider. A big thanks to Game Servers for providing our gaming league with such fine private match servers. Please tell your friends and urge them to support Game Servers for all of their gaming needs! Get your Game Server from Game Servers! CPU® Magazine is a fantastic source for news and reviews for the computer power user. Our gamers love that CPU Magazine is the "Official Magazine Sponsor" of Club Conflict! CPU Magazine features a wealth of well written technical articles from a pc gamers power user point of view. Big thanks to CPU Magazine for supporting our league and LAN Events! Attendees of LAN in the Highlands 2012 each received a free issue of CPU. Click the banner above to sign up for a free (1) Year subscription to CPU! Thanks Computer Power User! Sign-A-Rama Greensburg is a fantastic source for all of your sign and graphics needs. Sign-A-Rama Greensburg supports our organization by helping to create the league's promotional banners, vinyl decals and more. In the near future, look for custom Club Conflict graphics created by Sign-A-Rama Greensburg including Club Conflict Logo "false-etching" appliques for your windowed game case. Thanks Sign-A-Rama Greensburg! Would you like to see your product in front of potentially thousands of gamers? Contact Club Conflict Marketing for Sponsorship Opportunities. We are currently looking for our next Prize Sponsors. Click the banner to inquire about sponsoring Club Conflict with your product.